Hike the Famous Chilkoot Trail, and then enjoy a calm raft float down the Taiya River in Dyea on this popular Skagway tour. Your tour starts with a nearly 2 mile hike where men took the first steps toward hopeful fortunes during the Klodike Gold Rush. You guide will bring this storied history to life as you make your way through lush temperate rain forest en route to our raft put in. 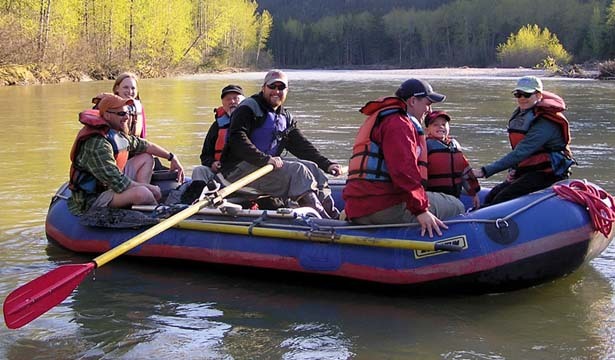 From our comfortable rafts, you will then wind your way down-river through dense stands of spuce and alder teeming with wildlife such as bears, otters, and seals. You will then enjoy a homemade snack and beverage before heading back to Skagway. Rain gear provided (if necessary), but if you have your own it is always a good idea to bring it. Camera, binoculars, sunglasses, and sturdy footwear like hiking boots recommended.